Welcome to www.paisawapas.com. Please read these terms of service ("Terms of Service" or "Agreement") carefully as they contain the legal terms and conditions that you agree to when you use the service provided by us through Paisawapas.com ("Site"). Paisawapas.com which is referred to as "Paisawapas", "we" or "us" in the following document. By registering as a user on Paisawapas.com, you are accepting our terms of service. Therefore, you must read and understand this document before using our services. This document may be subject to change in the future at our sole discretion as stated in clause 14 below. 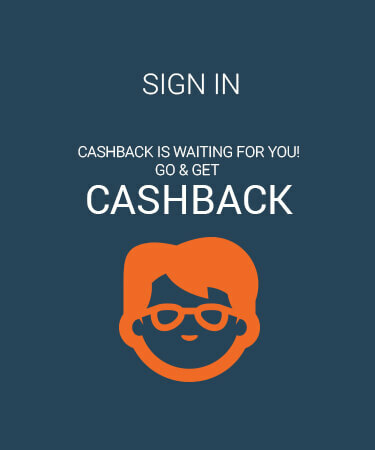 Paisawapas.com enables its registered users to avail Cashback on their purchases from retailers listed on the website. Paisawapas.com also provides discount codes and coupons of various online retailers. You can also contact us incase you seek more information or have any queries regarding our services. Paisawapas.com is intended to be used by Indian customers and only provide Cashback in Indian National Rupee (INR). One must be an Indian Resident and at least 16 years of age to register for a Paisawapas.com Account. Only one account is allowed per person. Change of Name & Email on your Paisawapas.com account is not permitted due to security concerns. Therefore,you must provide only genuine, accurate and current information while registering for an account with Paisawapas.com. This information includes your name, email address and other relevant details. You are also liable to keep this information updated in case of any change. As your email address is critical for a seamless communication between you and us, you must ensure that you have full access to the email address you provide us. Paisawapas.com reserves the right to terminate any account incase any fraudulent, abusive or unfair activity is observed from that account. In addition, accounts that are deemed to be "inactive" as per clause 15 may also be terminated. In case user does not provides us with a valid or serviceable email address, his/her membership will also be terminated. We also reserve the right to refuse or deny membership to any individual. As a Paisawapas.com member you can avail Cashback for making a purchase from various retailers listed on Paisawapas.com. However, Paisawapas.com can only provide cashback on genuine transactions which are successfully tracked and verified by the retailers. Once your transaction is successfully tracked and verified by the retailer, we get a commission from the retailer and we pass on this commision in the form of cashback onto you. Please take into account that under certain conditions, your transaction may not get tracked or qualify for a cashback. Under any circumstances, we cannot be held responsible for the same. Retailers deem a transaction to be genuine or valid through their own set of rules. A transaction deemed as non-genuine or invalid by the retailer would not qualify for a cashback. 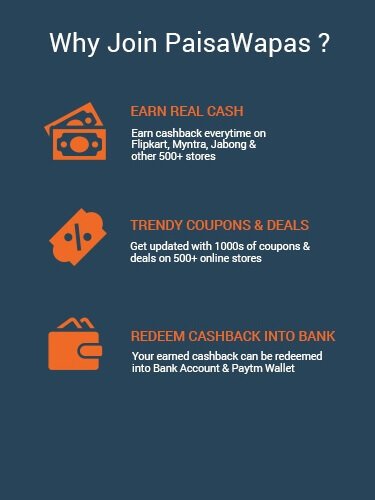 Paisawapas.com would always make the best efforts on its part to recover non payments and missing cashback from the retailers. In case, you made a genuine transaction and did not receive a cashback, you can make a claim by contacting our support. However, we reserve the right to stop chasing your cashback claim at any point and our decision will be final in this regard. At times you may receive a lower amount in cashback than what you were expecting. This happens when retailer gives us an amount less that his original claim. In this case, you may raise a query and we would take it up with the retailer. Though, we reserve the right to close this enquiry claim if the retailer still does not pays in a period of three months. a. In case the user is not logged in while transacting through Paisawapas.com and we receive an unattributed cashback payment which is not associated with any user account. b. In case the cashback is attributed to an account which is terminated by Paisawapas under Clause 4 or 11. - Only genuine and unique referrals will be paid. - Referred member must accumulate cashback amount of at least Rs.100 in his/her account. Multiple accounts or signups by the same user or any fraudulent signups will result in permanent termination of the accounts. Users can make a payment request as per their convenience once they have met a certain criteria. User must ensure to provide correct and updated payment details. Paisawapas.com will not be responsible for payments made to incorrect destinations. Paisawapas can also be not held liable for any delay in payments. In case any unusual or fraudulent activity is detected from any account, we reserve the right to place on hold all payment requests from that account indefinitely until further investigation or cancel any cashback accumulated till date. Paisawapas.com is protected by a copyright. Paisawapas.com solely holds all copyrights, trademarks and intellectual property rights pertaining to Paisawapas.com and its services. No one may copy, reproduce or distribute any part of this site with or without modification or any data contained within the site without our prior consent. No one may commercially exploit the identity, logo or services of Paisawapas.com. By uploading any kind of material on Paisawapas.com, you also grant us a non exclusive right to use, reproduce or distribute that material. Please note that all transactions you make are with individual retailers, not with Paisawapas.com. Paisawapas is not involved in any way in the transactions you make on any of the retailer’s website listed on Paisawapas.com. Paisawapas.com merely redirects you to the retailer's website and thus is free from any liability or legal obligations that may be applicable to the sellers of those goods and services. - Quality, safety or legality of the goods and services offered by retailers listed on Paisawapas.com. - Whether the retailers can or will supply the goods and services they are offering. Paisawapas.com reserves the right to terminate any user account and forfeit the earnings of the same, if it is found to be in violation with any of our Terms of Service. Users must not make or attempt to make any transaction with a retailer or to gain cashback by providing incorrect or false information. Users must also refrain themselves from fraudulently or unfairly exploiting retailer's offers. In the event of tampering with the website including modification of URLs, distributing unauthorized URLs, email cloaking, running automated scripts or pages being spidered will also result in permanent suspension/termination of the account. - Be defamatory, offensive, abusive, obscene, indecent or of malicious nature. - Contain any computer virus, macro virus, Trojan horse, worm, or anything else designed to interfere with, interrupt, or disrupt the normal operating procedures of a computer or to surreptitiously intercept, access without authority, or expropriate any system, data or personal information. - Violate any applicable law or regulation. - Breach the rights of any person or entity. - Advertise any goods or services. We would like you to report to us, incase you see anything on Paisawapas.com that violates the above mentioned criterion. Each user also acknowledges that Paisawapas is entitled but is not obliged to remove any such material that is violation with above mentioned criterion. The user will be responsible for any legal issue arises by the content posted by him/her. Paisawapas.com will only be liable as explicitly stated in this document, but will be free from any other liability, duty or obligation whatsoever in contract, tort or otherwise. Paisawapas shall also not have the liability to you or any other entity/person in respect of material provided by users, transactions (or non-transactions) with retailers, or any activity or communication relating to such material or transactions. Users are solely liable for maintaining the confidentiality of their password and Paisawapas cannot be held responsible for any password theft or any consequences arising from the same. Though, we take the utmost care and the most stringent measures to ensure that the information present on Paisawapas.com is accurate and up to date, we do not take any liability for any error or ommision or any loss arising from the same. We solely reserve the right to modify the terms and conditions listed in this document and post a new one, at any point of time at our sole discretion. Users will thoroughly be notified of any modifications and the new Terms of Service will come into effect no later than 30 days. We reserve the right to terminate any inactive accounts. "Inactive" Accounts are those accounts which do not show any activity for a period of 12 months. To avoid your account be marked as inactive simply log in to your account once every 12 months. All the redeemable or pending cashback/reward on inactive accounts will be fortified. In the event of our failure to act upon any breach of any provision of this Agreement will not constitute a waiver of our right to subsequently enforce such provision or any other provision of this Agreement. In case any part of this agreement is held to be invalid, the remainder of this agreement shall remain to be valid and enforceable. We reserve the right to terminate the Program in whole or in part at any time with notice. In the event the Program is terminated, You will have sixty (60) days to redeem your Paisawapas Cashback from the date notice is transmitted by Paisawapas to the email address or residential address specified in Your Account, provided to Paisawapas during Your registration with Us. We will not be responsible for failure to notify You of Program termination where such failure is caused by an inaccurate email address or residential address, or Your failure to check Your mails. We make our best efforts to rigorously scrutinize all the content posted on Paisawapas.com. However, we cannot be held responsible for any kind of loss or damage to the data on your computer occurring while using Paisawapas.com. All the provisions of this document and our relationship with each user of Paisawapas.com, is governed by the laws of India. Any dispute arising in relation to this agreement would be exclusively subjected under the jurisdiction of Bangalore court. Paisawapas will not file an Individual agreement for each and every user who registers on Paisawapas.com. You can access this agreement from our website. It is recommended that you keep a copy of this agreement by printing or downloading it on on your personal computer. You cannot assign any of Your rights, obligations, privileges, or performance hereunder without the prior written consent of Paisawapas. Participation in the Program is personal to You. Paisawapas Cashback received under the Program may not be assigned or transferred to any third party, except as expressly permitted by Paisawapas, in writing. The sale, transfer, lending, exchange, pooling or barter of any Paisawapas Cashback, other than by Paisawapas, is expressly prohibited. Any Paisawapas Cashback assigned, sold, or otherwise transferred in violation hereof may be confiscated or canceled. For any queries regarding our terms and conditions you may contact us through email. Please note that all communications under this Agreement are to be sent and received only by email. For this purpose, your notices should be sent via our contact email, and we will send you our notices at the email address you provide us when you register for an account on Paisawapas.com. You can reach us on 'contact@paisawapas.com'.